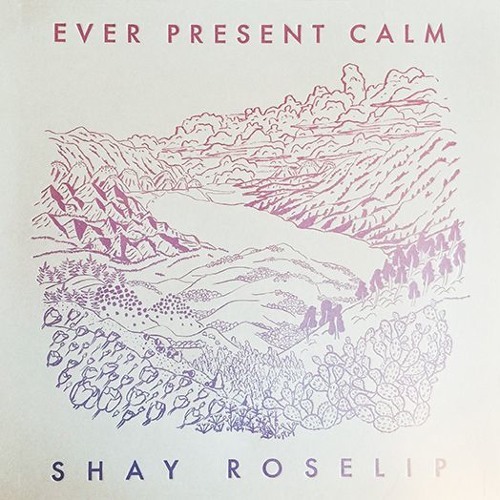 "Ever Present Calm" by Shay Roselip. LP/Cassette. February 9th, 2016. Gnome Life Records SHAY ROSELIP beams his songs down from the Pleoades. Starlight masquerades as propulsive multi-layered guitars and woodwinds. Oceans of vintage synth tones spill out like the Milky Way. And a hushed and beautiful voice shines cool and clear, in the moonless night. This is cosmic pop for the newest age. Ever Present Calm - Roselip’s first full-length release - is a pilgrimage through the infinitudes of outer and inner space. Deep, lugubrious bass lines, and emotionally open lyrics, cut a clear path for us to follow these complex tune-ways. Arpeggiating riffs and tonal cascades open like so many portals around us, begging the exploration of the extra dimensions that hide inside us and in these songs. Recorded in Bolinas, Big Sur and Inverness, Ever Present Calm is imbued with the etheric power and intoxicating beauty of California’s wild coast. This album was performed and composed by Roselip along with producer Jeremy Harris – current member of Vetiver, founder of new age music imprint Quest Coast Quarterly, and editor of the Inverness Almanac. The first pressing of this release is limited to 220 hand-numbered copies on white vinyl, with deluxe letter-pressed jackets. The cassette edition is limited to 200 high fidelity tapes in silk-screened, cardboard tape boxes. And the album will be available via all major digital outlets. Dude this is an incredible track thanks Shay and Gnome Life!